Kete 1. (noun) basket, kit. Huia. 1. (noun) bird native to Aotearoa/New Zealand now considered extinct. Are you wondering where the name of my blog “Huia’s Basket” and web address came from? How do you say that word ketehuia anyway? Just tap the links for pronunciation and read on for enlightenment! One day I was talking to my friend about the importance of branding on social media (a future blog topic for sure!). It’s imperative to have a logo, hashtag and representation that truly reflects how you want to present yourself. This image becomes your first impression. It is your “shop front” before anyone has ever seen or read anything you’re trying to sell. Of course this led to a brainstorm session about names for blogs etc. Although at the start, I didn’t even know what I wanted to represent. How I see myself has always kind of got in the way of how others see me. Those variegated views never really align neatly – or is it the the world around us is truly merely a reflection of ourselves? So the first step to choosing a blog name was to put some thought into my “brand”. There is only one me just like there is only one you. So what is unique about me and what did I like to talk about? I was already using “who-we-are”, “#phattbaby”, “#phattathlete” and Huia’s Culinary Movement on Facebook. “Huia” being my name and unique everywhere except Aotearoa/New Zealand. “Wakahuia” or “treasure chest” sounded really good. My grandmother often sailed on the schooner named “Huia” with her uncle, Captain Thomas Henry Lane and “waka” meaning “vessel” in Maori. Unfortunately “Wakahuia” was resoundingly taken. One reference is to a documentary series and another is to a famous kapa haka group. Here they are singing “Circle of life”. In a flash of inspiration following the intense brainstorming session, up popped “ketehuia”. 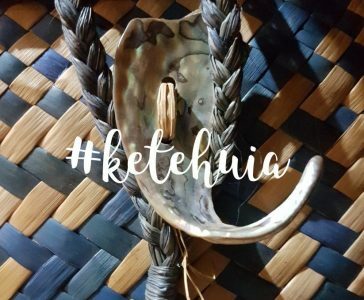 “Kete” meaning “basket” but also in reference to the Maori account of Maui collecting the baskets of knowledge. The “Huia” part is kind of obvious especially when “ngutu huia” translates to “know-it-all”. So there we have it. Baskets of wisdom from the sacred lips of a know-it-all blogger! Ps Have you noticed the gardening terminology? It’s all organic because my last name was “Woods”. Previous Post Hellooo World!!! I’m a blogger!! !